It is a story of determination, desire, and self-discovery. The main characters were Shaurya, who has dreamed of going to Mumbai to become a filmmaker. Miraya, an interior designer comes to Jaipur for a new start of her life. Anubhav, an ambitious entrepreneur and Kasturi, Shaurya's love interest and neighbor. Shaurya wants to go to Mumbai but due to family pressure, he persuades CA. Miraya had a broken marriage which she wants to forget and try to focus on her work. Anubhav faces a tragedy of losing his parents and soon become alcoholic and disgrace for his company. Shaurya's unfulfilled dream ate his soul but he was unable to take stand for his dream while Kasturi helps Shaurya and Miraya and then three of them help Anubhav. They all have their problems except Kasturi and it was a bit confusing. They all share an emotional bond with each other. Each character tried to overcome his/her fear or insecurity. I like the part when Anubhav wants to end his life and these three musketeers help him to restart his life. The author tried to keep the characters simple but they are immaturely developed. Sometimes characters overreact to silly things. 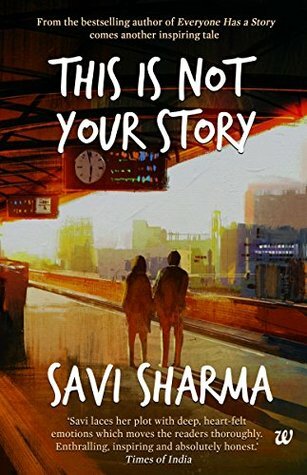 Savi Sharma's debut 'Everyone has a story and now 'this is not your story', I really don't understand her obsession with the word Story. But the story is completely different from the one she had written in her debut book and his writing is definitely improving. Some unwanted things or phrases use again and again which is annoying like the way Miraya started drawing at any place and the storyline is kind of boring at few places. Overall it's a light-hearted story and if you like a simple fictitious love story with no surprise element than this is definitely your story to read otherwise it's a waste of time and money.